Learn how to sew a blouse. Learn all the tricks without enrolling first! Catch a glimpse behind the scenes of a course! I am confident you will love it! When you enroll to a course, packed with sewing tips and tricks, you also receive the pattern to work with. It's the best of both worlds, you can work with a detailed E-book and at the same time you can watch the video course which shows you step by step how to achieve a professional look. In this course you will learn how to insert sleeves, work with facings and interfacings, finish the hem and so much more. The beauty of this course is that the videos are completely free, so you can learn without a purchase and get to know how Frocks & Frolics courses are set up. I am sure you will adore the blouse and will want to make one yourself. It is a great training ground for all you aspiring designers out there. So just click on the course element you want to watch, get comfy and start learning! What's included with the Virginia Pattern? 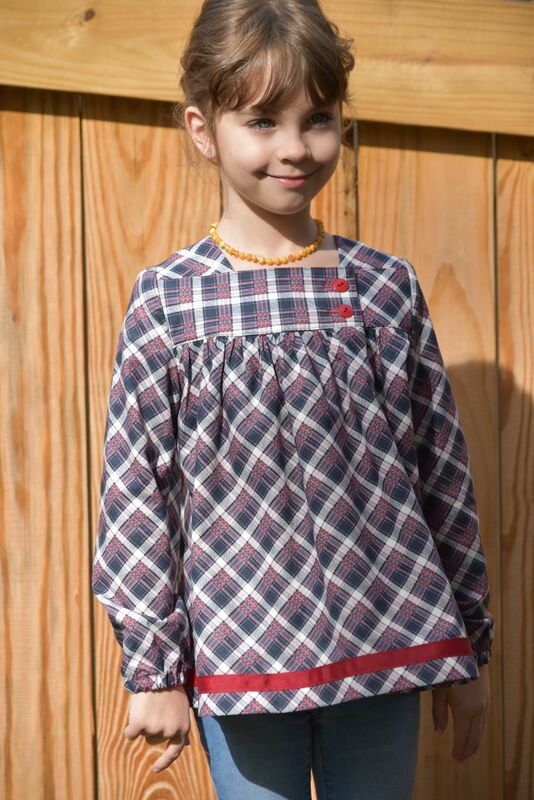 The pattern runs from age 1-12 and comes in knee, hip and dropped waist length. It has comfortable slender long sleeves with an elasticated hem. Yup nothing difficult here! You can also opt for a turned up cuff or an everyday knitted cuff. It is versatile and looks fabulous. For the summer just add short sleeves from another frocks & frolics pattern. They all fit, isn't that great? For the autumn style it with boots and legging. So if you already have the western blouse or classic Bolero, you have another option to gt really creative. For me the best patterns are always the ones you can wear everyday. This is one of those all rounder patterns, you will use over and over. The easy Kam Snap closure makes this such an easy project for you. If you are a beginner and want to step up your game then this is it. I love sewing this pattern as with any of the other ones I own from Marina. I’m a newbie at sewing, and all of my relatives, friends and even myself are impressed with all what I’ve been able to create. Marina’s instructions are easy to follow and the video instructions are a beginners dream. My daughter is totally in love with her new dress, even thought I didn’t make it in her favorite color, she was comfortable and stylish, so mama is very happy. I totally recommend this pattern to anyone. Very nice pattern. Not so easy with all the little shoulder bits though! Luckily the video covers all that, so you won't go wrong. Absolutely love what it looks like! It is a gorgeous blouse, with asymmetric closure and beautiful plain sleeves. Log in to watch all the course content for free!